Divorce proceedings cost an average $10,000 to $15,000, according to GOBankingRates. That's due largely to lawyers' fees. It's vital that individuals minimize additional financial fallout. The last thing you need is another financial blow due to negligence, malice, or misunderstanding. Divorce and legal separation laws in the United States are decided on a state level. That means the first step to financial security is finding out when you stop being liable for debts incurred by your spouse. In Pennsylvania, for example, a debt and assets cut off date is known as the "Date of Separation." That date is either considered the day the divorce complaint is filed or the day that the decision is made to separate (either moving out of the house or into a separate bedroom). In other states like New Jersey, liability for your spouse's debt doesn't stop until the divorce is actually finalized. Couples can also, depending on the state, opt for a legal separation. 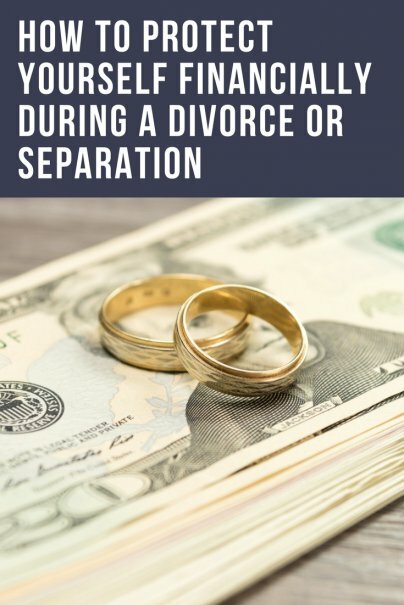 Legal separation is a lot like a divorce, but the couple remains married, which allows them to file taxes together and remain on their spouse's health insurance. It could be a solid stopgap if you're unsure if a divorce is the right answer. Individuals who are separated or divorced might want to begin to track and document all potential assets. That means taking pictures of evidence, hunting down legal documents, and familiarizing yourself with your joint and individual financial portfolios. Spouses often utilize temporary separations as a means to collect evidence before officially filing for divorce. It might be best to assume your spouse is already considering what needs to be done to come out ahead if a divorce is imminent. If you don't divorce, you'll at least have a better sense of your financial footing. If you suspect the divorce might get ugly, you should also consider keeping important documents in a safety deposit box and having important mail sent to a PO Box. This will cut the risk of anyone stealing or destroying important documents during divorce proceedings. Separation and divorce leave an individual's finances and credit score in jeopardy. An estranged party, who might or might not be feeling charitable, still has control over your financial health. Now might be the time to start separating yourself. Once the division of assets has been agreed upon legally or verbally, you can begin closing the accounts by selling off assets, refinancing loans, removing one party from the loan, or switching credit card debt to a new card. Request a credit report and look for accounts that need to be canceled or updated. You want to identify joint accounts or accounts where the other party is an authorized user. Credit reports are the easiest way to ensure you don't miss one. Separation can be a long, arduous, and expensive task. Individuals in the middle of divorce or legal separation proceedings can appeal in the courts to be granted temporary relief also known as "pendente lite." The temporary support, if granted, could lead to the primary bread winner providing temporary alimony, child support, and household payments. If the support isn't granted, you might be able to petition the courts to have the other party financially responsible for part or all of the debt incurred while separated. Divorcing or separating parties can also negotiate whether alimony payments are tax deductible. In some cases, it might be better to make the payments nontax deductible. This is more common if one spouse is in a higher tax bracket.